The shoulder is perhaps the most flexible and the most overworked ball-and-socket joint of the entire human body. It is composed of three bones, namely, the humerus or upper arm bone, the scapula or shoulder blade, and the clavicle or collarbone. The head of the humerus is shaped like a ball, which fits into a shallow round socket in your shoulder blade called glenoid. This relatively small ball-and-socket joint called the glenohumeral is encapsulated by a covering of muscles called rotator cuff and is secured in its place by strong cords called tendons. Moreover, a layer of cartilage forms a cushion between the bones to keep them from rubbing together and to absorb any shock impact. Within this cocoon of cartilage, muscles, and tendons, a soft tissue called synovium secretes fluid to keep the joints lubricated and the cartilage healthy. This intricate framework of muscles and ligaments accords a wide range of motion to your shoulder, making it the most mobile joint in your body. But with this increased mobility comes its fair share of hassles. A glitch in the working of any of the element of this complex shoulder architecture can trigger mild to chronic discomfort and pain. According to a 2005 study published in the BMJ, self-reported cases of shoulder pain are estimated to be between 16 percent and 26 percent, which goes to show how prevalent this problem actually is. Also, it has been noted that shoulder pain is the third most common cause of musculoskeletal-related visit in primary care. Shoulder pain can spring from any of the muscles, ligaments, or tendons in and around your shoulder and can be awfully debilitating. First of all, an impairment in the shoulder greatly hampers your ability to move freely. Second, once your shoulder starts hurting, it can be hard to concentrate on anything else. Thus, something as common as a shoulder ache is not to be taken lightly as it can significantly impede your ability to carry out daily chores and office work. People of all ages can experience shoulder pain. However, people who use laptops, tablets, and smartphones for extended periods are more prone to this problem than others. Can shoulder pain occur without any external injury? What is the best treatment to get instant relief from shoulder pain? Can shoulder pain be treated as a sign of a heart attack? What are the best-suited sleeping positions when one is suffering from shoulder pain? Can shoulder pain escalate during the night or during certain weather conditions? Please provide some additional tips or inputs regarding shoulder pain for the benefit of our followers. Since the shoulder is the most flexible joint, a number of factors and conditions can contribute to shoulder pain. The most prevalent cause is an injury to the soft tissues, including the muscles, tendons, and ligaments within the shoulder. This could be due to repetitive use or overuse injury. It can even be due to soreness of the tendon in the rotator cuff. Sometimes, the pain in your shoulder is actually emanating from injury to some other adjoining area, such as the neck or biceps. This is known as referred pain and does not aggravate with shoulder movement. If you have previously suffered from any shoulder injury or ailment, it is well advised to regularly perform a few simple range-of-motion exercises to keep your shoulder muscles and tendons properly stretched and flexible to avoid recurrence or a frozen shoulder. If you are prone to shoulder issues, it may be a good idea to follow up your regular workouts with 15 minutes of massaging your shoulder area with an ice compress. Drink a few glasses of warm lemon water daily to prevent mineral deposits in the joints that can cause pain in your shoulder and other body parts. If the pain on your shoulder is interfering with your daily activities, then it may be a good idea to see a doctor about it. Additionally, if the pain tends to worsen with even the slightest movement of the shoulder, then a consultation with an orthopedic specialist is warranted. If the pain and discomfort continue to persist despite proper rest and care or spike to an unbearable degree, professional medical assistance must be sought for proper diagnosis and treatment. More importantly, a sudden shoulder pain without any culpable cause or injury can be a telltale sign of a heart attack. If you experience any such unfounded discomfort, seek emergency medical help. As far as minor shoulder pain is concerned, you can effectively manage or even treat the problem at home, too. There are several remedies, simple exercises, and certain lifestyle changes that can help you shake off that shoulder ache and keep you safe from falling victim to it again. However, it is advisable to consult a doctor if the symptoms seem to be worsening. 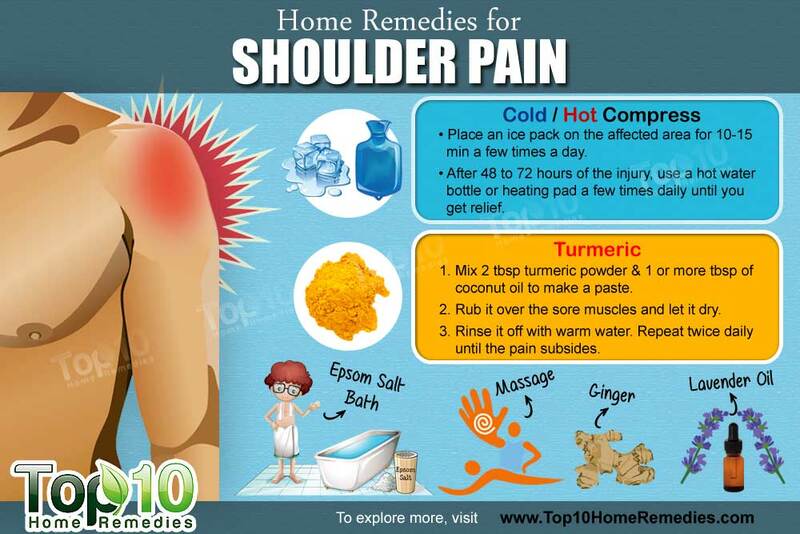 Here are some home remedies for shoulder pain. Cold compresses are highly beneficial in alleviating shoulder pain. The cold temperature helps numb the area, which in turn reduces inflammation and pain. For swelling, reapply the compress after two hours. Keep doing this until the swelling and pain subsides. Alternatively, you can also soak a towel in cold water and apply it on the distressed shoulder. Note: Do not place ice directly on the skin as it can cause frostbite. 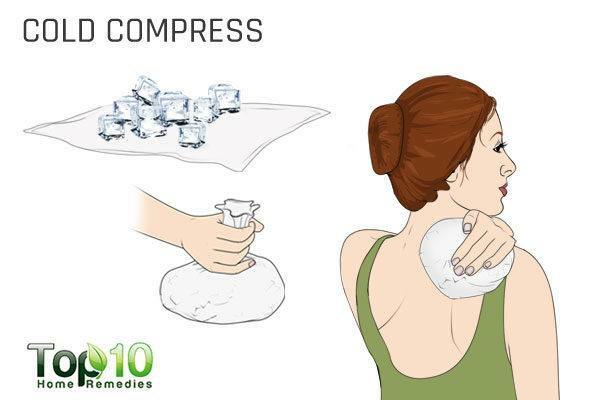 Just like cold compresses, hot compresses also help treat shoulder pain, inflammation, and swelling. It is, however, best to use hot compresses at least 48 hours after the injury has occurred. Hot compresses also help relieve the pain stemming from tense muscles. Fill a hot water bag with hot water and apply it on the aching shoulder for 10 to 15 minutes while lying down comfortably. Repeat a few times a day until the pain goes away for good. Also, you can stand in the shower and run warm to slightly hot water on your shoulder for 5 to 10 minutes. Try to keep still while exposing your shoulder to the soothing stream of water. Additionally, you can enjoy a hot shower twice daily. According to the Arthritis Foundation, both compression and elevation can help reduce shoulder pain and swelling, especially if the problem is associated with arthritis. Compression means putting even pressure on the painful area to help reduce the swelling. A compression wrap gives ample support to your shoulder and makes you feel comfortable. On the other hand, elevation helps to promote proper blood flow to the affected area, which, in turn, facilitates faster healing. You can compress the affected area using an elastic bandage or a warm wrap, which are readily available at most pharmacies. Wrap the affected area for a few days or until the pain and swelling are gone. Also, keep your shoulder elevated with the help of pillows to promote healing. Note: Avoid securing the wrap too tightly as it can lead to poor circulation and thereby can worsen the condition. Massage is another good way to reduce shoulder pain. A gentle massage will help your shoulder muscles release stress and tension. In addition, it will improve blood circulation and reduce swelling and stiffness. You can also get someone else to give your shoulder a nice and gentle therapeutic rub. For the purpose of massaging, olive, coconut, sesame, or mustard oil will work just fine. Warm the oil slightly and apply it on the shoulder. Gently squeeze the shoulder muscles and apply pressure to relieve pain and encourage blood flow. Massage for about 10 minutes, and then put a warm towel on the affected area for best results. Do massage therapy a few times daily until the pain subsides. Note: Do not massage the injured area if it seems to aggravate your pain. Exercise that targets the shoulder is an effective way to treat shoulder pain. It restores joint movement and reduces pain. Stretching exercises are especially beneficial as they encourage lengthening of your muscles, which in turn promotes flexibility and proper mobility. Strengthening exercises are also effective. A 2003 study published in Occupational & Environmental Medicine reports that a home exercise routine that includes shoulder stretching and strengthening exercises can be effective in reducing symptoms and improving the function of the shoulder. Another 2018 study published in Trials highlights the effectiveness of adding a simple shoulder strengthening exercise program to your daily schedule for mitigating shoulder pain. Aside from alleviating injury- or muscle strain-related shoulder pain, exercise has been found to relieve shoulder pain related to breast cancer treatment as well. Squeeze your shoulder blades back and together. Hold this position for 5 seconds. Lift your shoulders up toward your ears and start making small forward circles by gently rolling your shoulders forward, down, back, and up. Take a break for a few seconds, and then move your shoulders in backward circles. Do this exercise four or five times a day. Acupuncture and acupressure, which are traditional Chinese treatments, are beneficial and effective for relieving pain and improving shoulder function. In acupuncture, a therapist uses thin needles to apply pressure to specific points, helping ease the pain. Acupressure is performed on the same points but without the needles. A 2015 study published in the Annals of the Rheumatic Diseases highlights the potentially positive role of acupuncture in treating shoulder pain. It is a good alternative, especially for patients who regularly experience the adverse effects of traditional drugs. However, a large-scale, rigorously designed study is needed to confirm the results. 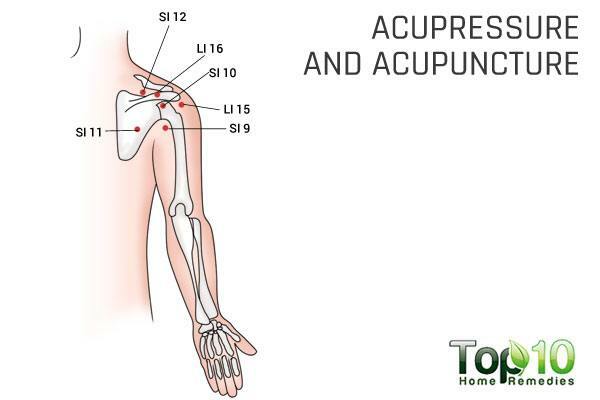 Some of the acupressure points to ease shoulder pain are LI 15, LI 16, SI 9, SI 10, SI 11, and SI 12. Always get acupressure and acupuncture done by an expert for optimal relief. To treat shoulder pain and reduce the associated discomforts, resting the affected area can help a lot. Keeping your pain-ridden shoulder free from any undue exertion is an important prerequisite in reducing pain and inflammation. However, keeping the joint completely immobile can also be counterintuitive to wholesome recovery. Even the experts at American Family Physician recommend active rest. One must avoid lifting of heavy objects when suffering from shoulder pain. However, it is recommended to keep moving the shoulder from time to time. A 2005 study published in the BMJ reports that any kind of rotator cuff disorders should be treated initially with relative rest of the shoulder. So, if you are experiencing shoulder pain, reduce or stop the activities that make the pain worse. However, try to move the shoulder gently. This is important as it helps to keep the shoulder muscles strong and flexible. 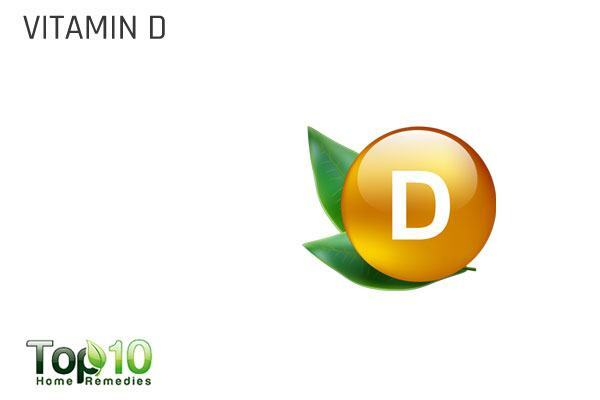 Vitamin D is important for cartilage and muscle functioning. Lack of adequate vitamin D in the body can cause general muscle pain and muscle cramps. Also, a low vitamin D level does not allow calcium to reach the skeletal system. Hence, increasing vitamin D intake can be beneficial for those suffering from shoulder pain. Another 2016 study published in the Journal of Inflammation Research found vitamin D to positively influence bone and muscle healing. However, more research is needed to conclusively determine the role of vitamin D in skeletal tendon health and healing. Vitamin D is best acquired through direct sun exposure, preferably early in the morning when sunlight is at its clearest best and for about 10 minutes. Also, you can eat foods rich in vitamin D, such as fatty fish (tuna, mackerel, and salmon), egg yolks, and vitamin D-fortified foods, including some dairy products, orange juice, soy milk, and cereals. You can opt to take a supplement as well, but only after consulting your doctor. Ginger contains antioxidant and anti-inflammatory properties that help reduce pain and inflammation of any kind, including shoulder pain. A study published in Pain Medicine in 2011 highlights the anti-inflammatory role of ginger constituents, which may reduce the subjective experience of pain in some conditions such as osteoarthritis. In addition, it improves blood circulation that promotes quick recovery. Drink 2 to 3 cups of ginger tea daily. To make the tea, simmer 1 tablespoon of sliced ginger in 1½ to 2 cups of water for 10 minutes. Strain, add honey, and drink it. You can mix ginger oil with olive oil and then use it to massage the affected shoulder two to three times a day. Turmeric is a good remedy to relieve pain in your shoulder. The curcumin in turmeric contains antioxidant and anti-inflammatory properties that help reduce pain and swelling. A 2017 study published in the journal Foods highlights the benefit of curcumin in inflammatory conditions and its role in reducing pain. Make a paste by mixing 2 tablespoons of turmeric powder and 1 or more tablespoons of coconut oil. Rub this paste over the sore muscles and let it dry. Rinse it off with warm water. Repeat twice daily until the pain is gone. Add 1 teaspoon of turmeric powder to 1 cup of milk and boil it. Sweeten it with honey and drink it twice daily to promote healing from within. You can also take 250 mg to 500 mg turmeric capsules up to three times daily. Consult your doctor for the correct dosage. Note: Avoid excessive intake of turmeric if you are on blood-thinning medicine. Epsom salt, made up of magnesium sulfate, can help reduce shoulder pain. It helps to improve blood circulation and relax stressed shoulder muscles. It also helps relieve stress from the entire body. Fill your bathtub with warm or tolerably hot water. Add 2 cups of Epsom salt and stir thoroughly. Soak in this water with your shoulder submerged for 20 to 25 minutes. When it comes to treating shoulder pain, another effective household ingredient is apple cider vinegar. It has anti-inflammatory and alkalizing properties that can help reduce pain and inflammation. Add 2 cups of raw, unfiltered apple cider vinegar to a bathtub of warm water. Soak in this water for 20 to 30 minutes. Enjoy this relaxing bath once daily for a few days. You can also drink a glass of warm water mixed with 1 tablespoon of raw, unfiltered apple cider vinegar and a little honey twice daily for a week to promote quick recovery. Lavender oil is an excellent essential oil that can relax tired muscles. This aids in reducing pain and inflammation. Add a few drops of lavender essential oil to hot or warm bathwater. 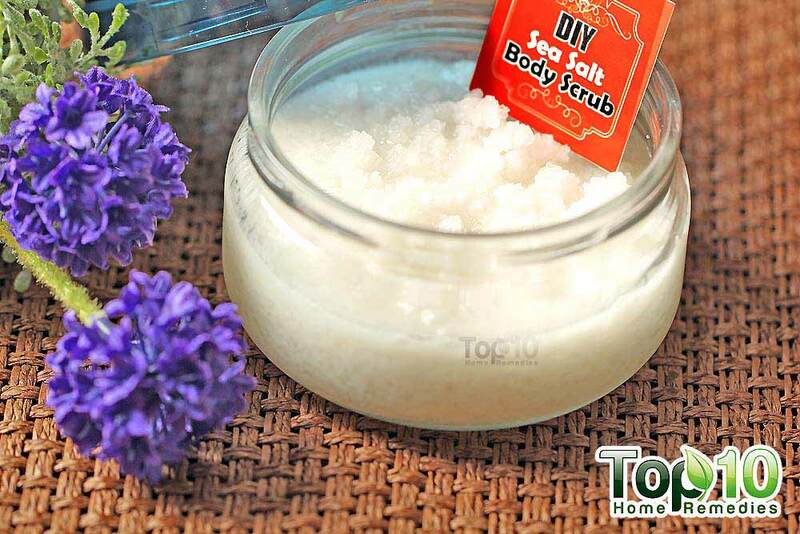 Soak your entire body in this soothing bath for 30 minutes. Do this once daily to relax your sore shoulder muscles. Mix a few drops of lavender essential oil in 1 to 2 tablespoons of warm olive oil. Use this to massage the tense and aching shoulder muscles for 10 minutes, twice daily, for a few days. Yes. Certain shoulder problems such as rotator cuff tears and biceps tendinosis, can occur as a result of injury or be insidious and gradually worsen. The patient may not even know that they have a problem until it starts to hurt. We call that a sub-clinical problem until it breaks through that point. Kind of like the straw that broke the camel’s back. Often an injection with numbing medicine (such as Lidocaine), sometimes combined with a steroid, can give relief. Over-the-counter medications such as Ibuprofen and Naproxen can also help. Sometimes just simple activity modification can be of benefit. In general, I prefer to make the diagnosis prior to embarking on the treatment. Yes, but that is usually accompanied by chest pain as well and is more acute. An urgent visit to the Emergency Room is appropriate for chest pain. Different positions work for different people. You will have to figure out which position makes it hurt the least, and settle into your own comfortable spot. Yes. Night pain is very common for patients with rotator cuff tears. Certain tumors may also cause night pain. Weather-related pain is common in patients with arthritis. Shoulder pain should be evaluated on a case by case basis. If you threw too much or lifted too much and your pain gets better with rest, then it is likely that there is not a major injury. However, if you have weakness or instability associated with the pain, then that is usually a sign that additional investigation should be done. If your shoulder pops out of joint or there was a major injury, then you should see a doctor. Maintain good posture to help your shoulder muscles heal quickly. When experiencing shoulder pain, keep your elbow at your side in order to give your shoulder a break. You can even try some simple neck stretching exercises to treat the problem. Use a thick pillow while sleeping to give enough support to your neck and shoulder. You can even apply a gel containing 0.0125 percent capsaicin topically on the affected area to reduce pain. Do not smoke or use other tobacco products as they can slow down the healing process. Mitchell C, Adebajo A, Hay E. Shoulder pain: diagnosis and management in primary care. BMJ. https://www.ncbi.nlm.nih.gov/pmc/articles/PMC1283277/. Published November 12, 2005. Shoulder Pain. AAFP. https://www.aafp.org/afp/2003/0315/p1319.html. Published March 15, 2003. Ways to Prevent Pain and Maintain Daily Activities. www.arthritis.org. https://www.arthritis.org/about-arthritis/where-it-hurts/shoulder-pain/shoulder-care/prevent-shoulder-pain.php. Yeun Y- R. Effectiveness of massage therapy for shoulder pain: a systematic review and meta-analysis. Journal of Physical Therapy Science. https://www.ncbi.nlm.nih.gov/pmc/articles/PMC5462703/. Published May 16, 2017. Ludewig PM, Borstad JD. Effects of a home exercise programme on shoulder pain and functional status in construction workers. Occupational & Environmental Medicine. https://oem.bmj.com/content/60/11/841. Published November 1, 2003. Clausen MB, Bandholm T, Rathleff MS. The Strengthening Exercises in Shoulder Impingement trial (The SExSI-trial) investigating the effectiveness of a simple add-on shoulder strengthening exercise programme in patients with long-lasting subacromial impingement syndrome: Study protocol for a pragmatic, assessor blinded, parallel-group, randomised, controlled trial. Trials. https://www.ncbi.nlm.nih.gov/pmc/articles/PMC5833202/. Published March 2, 2018. Tatham B, Smith J, Cheifetz O. The Efficacy of Exercise Therapy in Reducing Shoulder Pain Related to Breast Cancer: A Systematic Review. Physiotherapy Canada. https://www.ncbi.nlm.nih.gov/pmc/articles/PMC3817869/. Published November 4, 2013. S G, R B, E HS. Acupuncture for shoulder pain. Cochrane . https://www.cochrane.org/CD005319/MUSKEL_acupuncture-for-shoulder-pain. Published April 20, 2005. Abdelkefi I, Abdelghani KB, Kassab S. AB0956 Acupuncture Therapy for Shoulder Pain: A Study of 30 Cases. Annals of the Rheumatic Diseases. https://ard.bmj.com/content/74/Suppl_2/1219.1. Published June 1, 2015. Tague SE, Clarke GL, Winter MK. Vitamin D Deficiency Promotes Skeletal Muscle Hypersensitivity and Sensory Hyperinnervation. Journal of Neuroscience. https://www.ncbi.nlm.nih.gov/pmc/articles/PMC3319727/. Published September 28, 2011. Agrawal DK, Dilisio MF, Dougherty KA. Vitamin D and the immunomodulation of rotator cuff injury. Journal of Inflammation Research. https://www.ncbi.nlm.nih.gov/pmc/articles/PMC4913983/. Published June 14, 2016. Terry R, Posadzki P, Watson LK. Use of Ginger ( Zingiber officinale ) for the Treatment of Pain: A Systematic Review of Clinical Trials. Pain Medicine. https://academic.oup.com/painmedicine/article/12/12/1808/1846834. Published December 14, 2011. Hewlings SJ, Kalman DS. Curcumin: A Review of Its’ Effects on Human Health. Foods. https://www.ncbi.nlm.nih.gov/pmc/articles/PMC5664031/. Published October 22, 2017. Thanks for ur advices. .
Tying a muffler , woolen muffler around neck, helps . Pain can get cure within 15 minuts to 4 hours. That way wearing slippers or shoes in home, so that cold floor does not take away heat of the body also helps. If putting muffler around neck looks odd, then tie the uppermost button of your shirt which you usually keep open. If your neck is not so thick, this button of shirt can be tied. This will also reduce pain in just 5-15 minutes or at the most 45 minutes. This is more good than putting muffler around neck. This pains are all about maintaining heat balance in body. While taking rest on bed, take care that your body should not touch walls. Walls may be cold, they take away body heat resulting to pain. That way don’t sleep on floor or on a very thin carpet on floor. This can also lead to heat sucking by ground and pain evolving in body. All pains evolve when heat balance is lost. Eating heated food to gain heat does not spread heat uniformly in body as compared to sitting near a flame and warming the body. Heat is the solution for all pains at the condition that it is not intense but medium and within our tolerable ranges. Most grateful. I’ve just started.